YOU ALREADY KNOW THAT NEGLECTING TO FLOSS can lead to all kinds of oral health problems—including tooth decay and periodontal disease. But what most people don’t know (or don’t think about) are the correct and incorrect techniques associated with flossing. They’re not complicated and they’re important to know. We hope this helps! Nice job, Ned! 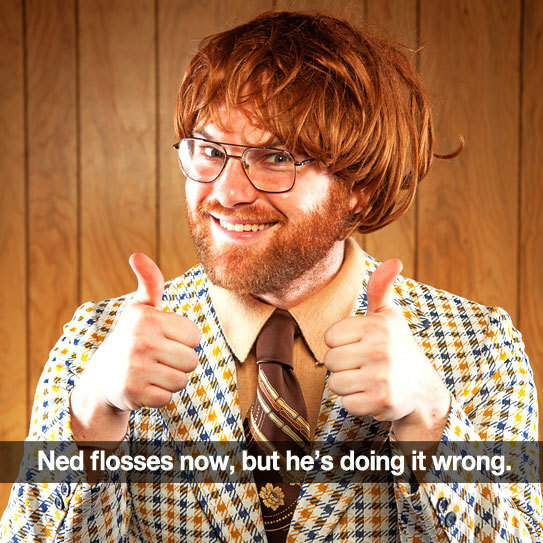 You’ve gone from never flossing to flossing more often! But there are still a few very important things that you’re not doing correctly. Now it’s time to tighten up those flossing skills! Don’t skip a day now and then. Floss daily to remove harmful bacteria. Don’t “saw back and forth” which could cut into your gums. Slide the floss up and down against the tooth’s surface. Don’t floss too aggressively. Snapping the floss into your gums can cut them and damage the tissue. Don’t forget to floss under your gum line to remove hard-to-reach plaque. Don’t forget to floss the back side of those very, very back teeth (even though they’re not up against another tooth). Start with about 18 inches of floss. Wind most around one finger and the rest around the same finger on the opposite hand. Be gentle! Slide the floss between your teeth and below the gums and then use a soft up-and-down rubbing motion. Use a new section of your floss for each tooth to avoid spreading bacteria from tooth to tooth. Flossing in front of a mirror can help you be more thorough. You can floss in the morning or at night, before or after you brush. Flossing is an important part of your daily oral health routine. However, maximizing the benefit comes from doing it correctly. If you have additional questions about flossing or any other aspect of your oral hygiene, please contact us. We’d love to hear from you! And you can always post questions directly on our Facebook page. Thanks for being our awesome patient!